Memes are cultural symbols and social ideas that spread virally, primarily with the intent to either make people laugh or to make fun of others. The meme content itself is usually something of minor everyday consequence: jokes about dad, urban legends, TV shows (including shows like Arthur, which has generated its own genre of memes) and movie references, human and animal oddities. In rare cases, memes can be profound art and music curiosities, and even philosophical ideas. 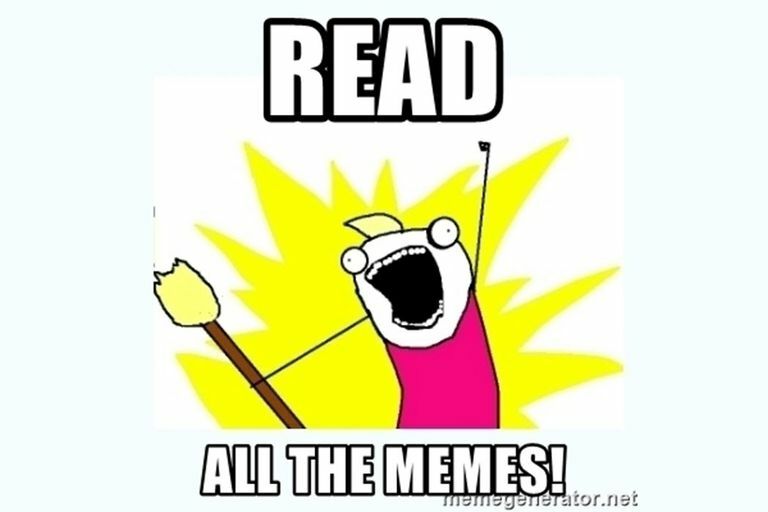 The noteworthy aspect of a meme is its infectious nature: It invites people to spread it through social media, email, and photo-sharing. Here are the most popular modern internet memes today. This 2015-2016 meme is a raging virus: It has propagated faster than any other internet meme. Bill is a stick person illustration, with white space left for captioning. The version pictured here is the Bill with the hat/toque headdress. You will also see versions of stick person Bill sitting at a computer. The irresistible appeal of Bill is that it is a powerful passive-aggressive way to make public judgments about other people's life choices. If you want to comment on something you disagree with, the innocuous Bill stick figure is an excellent vehicle to transmit your message. In the same way that Kermit and his teacup have become a tool for highlighting and criticizing others, Bill is a wildfire hit with anyone who wants to feel morally superior to others. You can create your own Bill meme narrative at imgflip. 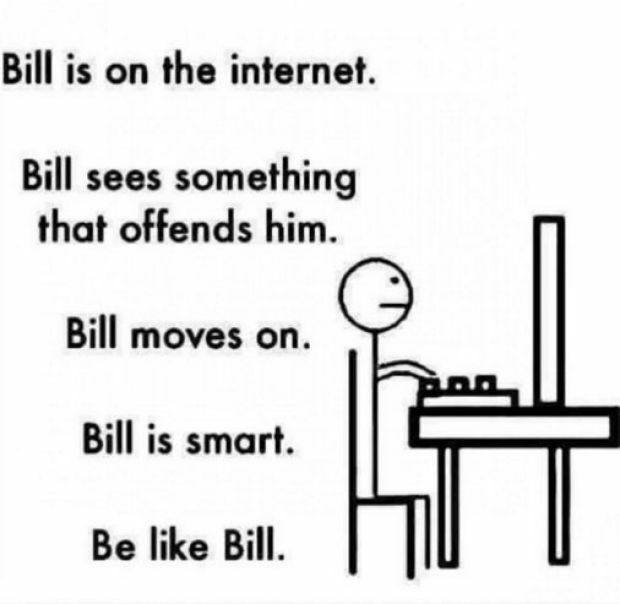 While the imagery seems innocent enough, this recent meme is used to openly pass sarcastic judgment on someone, much like Be Like Bill. When you think someone is an idiot for some life decision he or she has made, you can post a photo of Kermit drinking tea, along with the phrase 'but that's none of my business.' The memorable muppet image will help the message gnaw on the person's brain for a while, and remind them that they've been judged. Create your own Kermit teacup meme. When the trailer of the new Star Wars Episode 7 movie was released, fans went into a frenzy over the tri-lightsaber of the character Kylo Ren. Apparently, the functionality of such a mythical weapon was debatable. This spurred a viral form of playful vandalism where readers around the world "photoshopped" different implements onto Ren's lightsaber, like this example of a Swiss army knife in this photo. Grumpy Cat is a housepet from Arizona. Her real name is 'Tardar Sauce' and she has a disorder called 'feline dwarfism.' With a distinctive underbite that gives her a pouting facial expression, this little beast has become the poster child of sarcasm and faux negativity. Thousands of captioned meme photos have been based on Tardar's seemingly-sad face. In actuality, Tardar is a very happy and friendly cat, which makes the sarcasm memes even richer! Norwegian comedy and music duo, Ylvis, asked the question, "What sound do foxes make?" Sure enough, they not only provided the answer, but they presented it via a preposterous dance video that went viral. This musical meme was nearing 1 billion views as of this writing. These preposterous commercials are exactly that: preposterous. Yet these commercials have a real charm that makes women grin and men guffaw. Take a look at the number of hits that these Old Spice commercials get on YouTube. That should give you a sense of how viral these commercials are. This prankster meme refuses to die! 'Rickrolling' is when people pretend to send critical business email links in emails but they actually send links to Rick Astley music videos from the 1980s. Christopher Walken immortalized the expression 'more cowbell' on Saturday Night Live. Today, 'more cowbell' is a daily expression of humor. This particular meme won't reach you by email forwards, but you can certainly expect the expression 'more cowbell' to occur in daily conversation with the modern generation. 'U mad bro' is arguably a trifecta meme because it is simultaneously a meme, a conversational expression, and a form of trolling/flaming all at once. This meme expression allegedly started in 2003 when hip-hop musician Cam'Ron engaged in a heated discussion with talk show host Bill O'Reilly over how his music affected children. Over the last decade, 'u mad bro' has grown into a daily conversation term for the millennial generation, and spawned several versions of itself as 'he mad', 'she mad', 'why you mad tho', and more. Randall is an effeminate narrator who creates voice-overs for animal videos. He is renowned for coining the expression 'honey badger don't care,' which is quickly becoming a conversational phrase of courage. ﻿Randall's narrating is flamboyant, irreverent, profane, sassy, and preposterous all at once. His internet fame started with his narration of a badger video, where the little beast would hunt and eat its prey on screen. Oddly, Randall's narration is quite engaging, so don't be surprised if you find yourself wanting more Randall videos after honey badger. Since 2005, 'doge' has been a subculture meme thanks to the Homestar Runner puppet show. In this episode, the Homestar character nicknames his cohort, Strong Bad, as "d-o-g-e". Today, doge is a photograph meme commonly attached to photos of Shiba Inu dogs, combined with comic sans font and the use of bad grammar with comedic monologue text. Doge has also become the name for a new type of digital currency called 'Dogecoins'. 'Doge' has two common pronunciations: as a rhyme with 'rogue', or pronounced as 'dohj'. This smile-inducing prank has become a viral hit. The prankster is a faux newscaster on a gas pump TV. He starts a conversation with Will and Monifa Sims, two California customers filling up their minivan. The conversation turns into an impromptu singing performance, with Will and Monifa performing songs from the 1980s. This is a terrific example of human talent and infectious spirit and, if you're like most viewers, you will cheer and clap during this delightful video. This Finnish folk song has been mesmerizing online users for years. The animation is taken from the Japanese anime "Bleach," and the music is the "leval Polkka," performed by a quartet called Loituma. Yes, the girl is twirling a vegetable. Yes, it's dumb, but also oddly catchy. If you like the music, here are the Loituma folk singers performing the original. You may need to enable Flash in order to view this website. Matt Harding is another example of why people love the internet. You see, Matt is a deadbeat and a slacker who was blessed with the chance of a lifetime. In exchange for doing some amateur dancing on-camera, Matt was hired to travel the world and visit 39 countries on seven continents. Matt's travel adventures have surpassed what you and I could ever hope to achieve in a lifetime. 'All Your Base' is an 'Engrish' humor meme. It comes from the flawed translation of Japanese into English subtitles. Instead of 'all your bases belong to us,' this mistaken translation caught fire in 2001. The original video footage is from Zero Wing, a 1989 video game by Toaplan. Today, 'All Your Base' is a joke phrase used in pop culture. 'Good Guy Greg' (also known as GGG) is the endearing photo of a marijuana-smoking fellow with a likable grin. His photograph has been repeatedly captioned to be an example of acts of kindness and respectful public behavior. Good Guy Greg is quite a pleasant meme, actually, as it promotes the opposite of trolling and negativity on the Web. ﻿Make your own Good Guy Greg meme. A strange creature mascot for Japan's NHK television station, Domo-Kun is the humorous icon that is pasted into many disaster scenes. Don't be surprised if you see this pop-culture icon on websites. This mesmerizing optical illusion was created by graphic designer Nobuyuki Kayahara. It has fascinated readers across the globe since 2007. Is this dancer standing on her left foot and spinning clockwise? Or is she standing on her right foot and spinning the other way? Take a look for yourself, and watch how the ballerina can change direction before your very eyes. Focus on the standing foot, and you can almost will the direction change to happen. The most-liked video in YouTube history, this pop song was released by South Korean rapper, Psy, in July of 2012. In this video, Psy inspires a funny dance style involving an invisible horse and clumsy dance moves. The 'Gangnam Style' itself is a parody of people's perceptions of the upscale Gangnam District in the city of Seoul, where the residents are known to be wealthy and trendy. The video won the MTV Video of the Year. Here are the English lyrics to the Gangnam Style song. The absurd gallery of people attaching human behaviors and captions to photos of housecats. If you like Gary Larson's 'Far Side' cartoons, you are bound to like LOLcats/Cheezburger. 'Ermahgerd' is 'oh my god' as pronounced by someone with a speech impediment. It means 'shock' and 'stupidity' at the same time, often as a caption for unflattering photos. You can caption 'ermahgerd' on your own photos to describe that you did something stupid today, or you can use it to insult someone else by replying 'ermagherd' to their online posts. ﻿Ermahgerd is also becoming popular as a caption for animal photos, much like lolcats. For the most part, ermagherd is a derogatory term like 'doh' or 'durp'. You'd swear the cameraman was on some kind of acid trip when he shot this video. But Paul Vasquez claims that he was having a spiritual experience at the sight of this Yosemite Park rainbow. People have since flocked to his YouTube page to leave comments. Take a look for yourself, and decide if this home video is all just an act or a sincere life experience. This photo and video blog are mesmerizing! Here are pictorial essays on the tragic mistakes of people around the world. Bad drivers, stunts went bad, public faux pas embarrassments... this website is absolutely hypnotic in the way it depicts human folly. The idea of "schadenfreude" (delighting in other people's misfortune) has never been so humorously done. Be warned: Once you visit this site, you will be addicted to checking it every week for new additions. This catchy song by artist Lady Gaga is paired with some surreal costumes, and some mesmerizing dance moves. Whether you like Lady Gaga's music or not, you'll want to watch this video and decide for yourself what you think. Fred Rogers was an educational influence for millions of youth before he passed away in 2003. His PBS show inspired scientific curiosity, multiculturalism, a compassion for fellow human beings and animals, and a real hope for the future. ﻿The Public Broadcasting System recently remixed a montage of Mr. Rogers' work in this hypnotizing video. Unlike other memes, this video is thoughtful and non-flashy but if you followed Mr. Rogers as a youth, you are bound to find this new video to be resonant and moving. NONONO Cat is a special long-haired cat from Russia. In this video, he cowers in fear at seeing a young child for the first time. This feline begins to speak in seeming English, repeating the word "no" for several minutes. This is a much-loved meme video, especially among animal lovers. "OK Go" is an internet music group who specializes in sharing their music through oddball choreography. These artists made the famous "Treadmill" video meme (see later in this list) as well as this adorable music video of dogs and plastic furniture. Animal lovers should really enjoy this meme! This chubby lip-syncher, Gary Brolsma, has won the hearts of viewers everywhere. He lip-synchs an amateur webcam video to the song 'Dragostea" by the Romanian group, 'Ozone'. Millions of people claim that this is the 'worst music video' and 'worst song' ever made. Yet Rebecca Black's video has become a viral sensation across the world. ﻿This music video was shot with a budget of only $4000 and was taken offline because of the massively polarized attention it received. Rebecca eventually re-uploaded it, and you can decide for yourself if she should have. The doctored video of a youngster twirling a golf ball retriever staff. This young Canadian lad eventually earned money online as people donated funds to him. ﻿Fans of Star Wars should get a good kick out of this meme. This photo blog is so controversial. Started in 2009, this site is about showing repulsive photos of real-life shoppers at Wal-mart stores around the world. Some people will be offended by this meme, but thousands of viewers everywhere visit this site every day in horrified fascination. David is a young 7-year-old who just had his tooth removed. As he recovered from the general anesthetic, his father videotaped him with the new family Flip camera. During his wooziness, David proceeded to monologue in an endearing Hamlet-ish kind of way, questioning life and his medicated condition. In 2009, David's video was the second most-watched video on YouTube. Even funnier, see the Chad Vader parody video side-by-side with David. The preposterous exaggerations of Chuck Norris as a modern Superman, often randomly inserted into email conversations for humor effect. Don't be surprised if you find Chuck Norris references in your email, or on a web page . . . his powers are legendary! The shocking video of a young online gamer having an outlandish temper tantrum while playing Unreal Tournament. By all accounts, this is not a staged video – this is really a youngster suffering from very serious anger management problems. This little animation started in late 1995 and is still a favorite today. It was originally intended to demonstrate 3D drawing software in the animation world but instead caught fire as a curiosity meme once it was featured on the Ally McBeal television show. Years later, this animation is still making people chuckle. Hoax or not, this photo essay of two competing churches is a modern favorite. Commonly, this meme is forwarded as a large email containing all the photos of the two churches in question. This adorable little prankster not only sports a Forrest Gump accent but his prankster baby brother, Charlie, makes a fiendish little smile after biting the finger. ﻿This is one of the most viewed YouTube videos of all time. The street-humor website of Kent Nichols and Douglas Sarine of Los Angeles, this cheeky type of comedy is blended with modern street jargon and inane videos of ninja actors. Definitely a good laugh for people that enjoy this kind of humor. 'Engrish' is a sister site to Lolcats and Epic Fail Blog. Engrish captures photos of mistaken translations on signs and labels – all of which add up to some very bawdy and shocking humor. Most everyone who visits this site quickly forwards the link to their friends. Guaranteed laughs can certainly be found at this meme website! Alternative rock band, OK Go, has won the hearts of viewers with this challenging choreography meme. Four artists plus music plus six treadmills = instant meme! The choreography here boggles the mind, nearly everyone who watches this video immediately forwards it by email. 'Nuts' is a Canadian critter who stole a front spot in a family photo. There are now Beanie Babies and other products named 'Nuts the Squirrel' designed to take advantage of this guy's popularity. A fellow in Saskatchewan had this outlandish idea to repeatedly trade objects online until he was traded a house. It actually worked. Today, he now resides in that same house. ﻿See the photo gallery of his trading history at his site. In 2001, a dance festival video launched David "Elsewhere" Bernal into Internet fame. His rubberman moves became so legendary, David was asked to participate in advertising for Heineken and Pepsi. A conspiracy-theory take on Bert from Sesame Street. Like many bits of Internet humor, the idea is absurd and preposterous... and quite a hit with many Sesame Street fans of old. (Warning: adult content) From Saturday Night Live and The Lonely Island music group: a dance song about male sexual angst. The lyrics are renowned among males everywhere. Despair.com is one of a few memorable sites that have turned visual sarcasm into a meme phenomenon. Originally a parody of motivational posters, 'demotivational posters' take cynicism and sarcasm to the Nth degree. Catchy music with videos of small critters. The original hamster dance is from 1999, with a 9-second sound loop from "Whistle Stop" (a Disney movie). ﻿This clip has since spawned dozens of follow-up remixes and a top 40 song. A very short amateur video of a quirky rodent making gestures. If you're an animal fan, you might like these 3 seconds of human-like hilarity. Scientists have varying theories why there is such an explosive chemical reaction between Mentos candy and Diet Coke. But the science notwithstanding, the shock value and creative 'pyrotechnics' are worth 3 minutes of your time to watch these videos.